There are currently 114,611 users on this website. 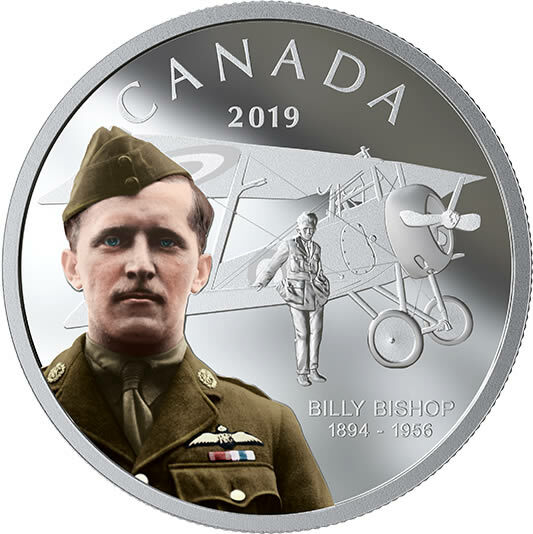 Royal Canadian Mint - Your coin features Billy Bishop standing with his first plane, a Nieuport 17 that he affectionately called "Little Daisy". In the foreground, a full-colour portrait of the flying ace with "BILLY BISHOP 1894-1956" engraved to the right of his shoulder. Royal Canadian Mint engravers reproduced archival photographs to create this design. The effigy of Her Majesty Queen Elizabeth II by Susanna Blunt with "20 DOLLARS" and "ELIZABETH II D.G. REGINA" engraved along the outer edge of the coin is featured on your coin's obverse.